NEET Counselling 2019 | Dates, Procedure, Schedule, Eligibility, Etc. Exams » Medical » NEET Counselling 2019 | Dates, Procedure, Schedule, Eligibility, Etc. NEET Counselling 2019 | The National Test Agency (NTA) will conduct National Eligibility Entrance Test (NEET 2019) on May 05, 2019. The NEET exam will be conducted in offline mode. Candidates attempting the exam can check their NEET result on June 05, 2019. The NEET Result 2019 will be declared in online mode and will be followed by the NEET 2019 Counselling. Candidates who successfully crack the NEET exam will have to go through the NEET Counselling process. The NEET Counselling and seat allotment process will be conducted by MCC. The NEET Counselling 2019 schedule is not released yet but worry not for we will update the NEET counselling important dates here as soon as it gets officially released. Along with the NEET result, NTA will release the official NEET Cutoff. Also, the AIR ranks will be forwarded to the Directorate General of Health Services, Ministry of Health and Family Welfare, And Government of India and Universities. 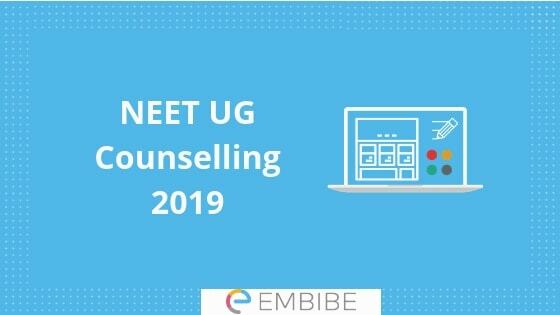 Read on to know more about the NEET Counselling 2019. NEET counselling for all India Quota seats, ESIC Quota and seats in central and Deemed universities will be conducted by Director General of Health Services (DGHS), on behalf of the Medical Counselling Committee (MCC). Besides that, the counselling for the state quota seats will be conducted by respective state counselling authorities. The seat allotment through NEET 2019 will be based on the candidates NEET rank, score, vacant seats in the college and the preferences made by the candidate. NEET UG Counselling process will be conducted for the seat allotments to the students who qualify their NEET written exam. Candidates will have to go through an online NEET UG Counselling procedure. The detailed NEET UG Counselling eligibility criteria is given below. Candidates are required to secure at least the minimum cutoff percentile in order of securing the qualifying rank for NEET Counselling process. Candidates with Jammu and Kashmir as the hometown are not eligible for the NEET Counselling process. During the NEET UG Counselling procedure, the preferences of the candidates will also be considered as an important factor affecting seat allotments. The NEET Counselling procedure will include the processes like registration, counselling fee, seat allotment etc. The candidates will have to first qualify the written exam in order of being eligible for the NEET Counselling process. Step 1- Registration – Candidates who qualify the written exam are supposed to register themselves for the NEET Counselling process. Candidates will register by using their personal and academic details. Step 2- Fee Payment – After filling the registration form for NEET Counselling successfully, candidates will have to pay the NEET Counselling registration fee as well. The registration fee is nonrefundable and can be pay into the online mode. Candidates can use debit card/ credit card/ net banking etc for the payment of the fee. Step 3- Choice locking – This step will include the process of choosing the preferred courses and the colleges. Candidates will be able to see a list of the colleges during the counselling process. Candidates are advised to choose the preferences in order of the priority. Step 4- Seat Allotment Result – The seat allotment process will be done as per the preferences made by the candidates. After the process of NEET Counselling, authorities will announce the NEET Seat allotment result. Step 5- Report to the College – Once the NEET Seat allotment process will be done, a time limit with all other required information will be provided to the candidates. It is mandatory for them to report to the college within a limited time. Step 6- Payment of registration fee – Candidates attempting the exam will submit a refundable tuition fee. The tuition fee will vary as per the ownership of the institute. The candidates joining the colleges under 15% AIQ/ Central Universities need to pay INR 10,000/- if general and INR 5,000/- if reserved. Moreover, Deemed university candidates of all categories are supposed to pay INR 2,00,000. Candidates who qualify the NEET UG counselling process will be allocated with a college. It is mandatory for the students to report to the college within the time limit. Also, at the time of the reporting, candidates are required to carry the important documents as per the instructions. We are mentioning the list of the required documents for your reference. As you prepare for your NEET 2019 exam, do not miss out on our personalized study and practice plans for your NEET preparation. Take free online NEET mock tests and get an instant personalized analysis of your attempts. We hope that our article on NEET Counselling was useful for you. If you have any query or feedback to share with us, please feel free to drop a comment below. We will get back to you within a very short time. Embibe wishes you all the very best.